Tech Trader Daily has a round up piece out this morning on the latest analyst scuttlebutt on Palm Inc. Concerns that the company may not find a buyer have so far sent shares down more than 10% in trading today. TTD's article sums up the comments from three long time Palm analysts, all of whom are rather pessimistic on the stock. UBS analyst Maynard Um thinks last Friday's SVP departure and executive bonuses are a sign that a deal is not pending and he reckons that interest in the firm may be tepid. Morgan Keegan analyst Tavis McCourt reflects similar sentiments, but goes even further stating "Palm's ability to execute a turnaround internally remains difficult." C.L. King analyst Lawrence Harris writes in a research note to clients that Radio Shack may be phasing out the sale of Palm devices. DigitalDaily has also jumped on this story, citing their empty Palm online store and a bunch of empty store shelves as evidence. However, a 'Shack spokesperson 'splains that they expect their relationship with Palm to continue. It seems that all that is being valued is a possible sale of Palm. Does more emphasis on the future of Palm quality innovation need more attention too? Palm is more than a company for sale it is a strong North American brand that has more to offer then just being for sale. Should the stock also be valued at Palms quality innovative future? Do all people that buy Palm support that value added quality innovative future? (I still am awaiting an Android-based phone on Verizon with comparable specs, at least a 4" AOLED screen, and a slide-out physical keyboard. Whoever brings that out will get my $! Moto Droid 2, perhaps? call it what you will - but both devices put the pre and pixi to shame. Excellent innovation wonderful to see great thoughts come to market. Many developers have their roots in Palm such quality and ingenuity is to be expected. Palm helps to raise the bar they have been pushing for excellence and have perhaps motivated others to be the best they can be. Such innovative ingenuity does not take away the potential a Palm signature Classic, or a Palm signature Jewel. If we have one enterprise doing everything who will push for excellence? It is the constructive competitive nature of North Americas hidden value that inspires an enterprise to create more content and others benefit from such creativity too. Thanks for providing the content it was very interesting and uplifting to see what the human mind can do. How come none of *your* posts provide any content? They keep rehashing the same tired ideas. Perhaps innovative content starts with a thought. Some have tremendous natural energy and may not become tired. Some keep going until such time as there is no purpose for the thoughts. One individual can not complete a purpose it takes like minded thinking and a budget to allow such thinking to become more content. Some may have tired of Palm too and look what happened. Have Palm products reached saturation in North America? The global market is still open. Perhaps 333,000,000 people need something new from Palm. Something with Palm Classic quality a Jewel made with precious material a signature series from the best of Palm past present, and future. Those that have bought Palm have helped to build the future why let the customer that have invested in Palm down. I've been seeing a gradual decline in the pricing and quantity of Palm-branded peripherals in non-corporate wireless stores (BB, Radio Shack, mall kiosks etc) since February or so. Also, all but one of the BB mobile stores near me have dropped the Sprint Pixi and the VZW Pixi Plus, though the corporate stores do still have 'em the last time I checked. But with hot new higher-margin handsets like the HTC Incredible & HTC Evo coming to both CDMA carriers, I don't think they are gonna be too inclined to keep shelf space for a low-end smartphone much longer...especially in VZW's case, as the Pixi Plus comes with a "free" hotspot feature that eats into their bottom line. I'm amazed at the rapid pace the CDMA carriers are rolling out high-end Android handsets. It looks like Sprint & VZ are doing their damndest to make an end-run around the iPhone with a variety of Android devices at all price points. That C40 cannot come soon enough, huh? The only lively discussions have been on the value of the bare Palm carcass and it's IP. I like some of the aspects of WebOS. I hope it finds it's way forward. That's because, aside from Tim (who has been preoccupied with Army stuff) very, very few of the "vocal PIC faithful" own a WebOS device. Some of us don't want one, some of us cannot get one for our country/carrier/network of choice, and some of us had one but returned it for a piece of more compelling (iPhone, Android) or proven (Garnet Centro/Treo). "This is the end, my friend..."
Went to BB Mobile today and the Pre Plus is down to $29.99 w/ activation. Pixi Plus & Pixi are already gone from the VZW & Sprint counters. A few Pre/Pixi accessories (side case & maybe another case) were on clearance and several others (Pixi Touchstone cover IIRC) were MIA. Is that right? Hadn't read it yet. Not at all surprised - their big "Graphics Expo Show had more crickets than developers if the photos of the "event" are to be believed. 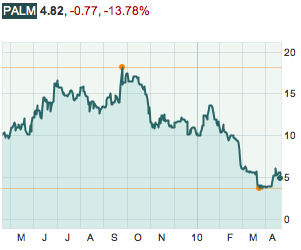 Palm has had a fair share of cheap shots in recent months. Radioshack has dropped Sprints original Pre and Pixi devices, device which can't really compare to the equivalent Plus models. I think this is a significant detail that seems to be missing from most peoples dialogue. If you look at Sprint as a carrier, I think it's fine they're doing this. I hope they can give us some compelling hardware this year. RE: Palm, please don't die. Joe Nongeek sees NO DIFFERENCE between the Pre and Pre Plus. Palm's horrendous and publicly admitted Verizon experience with the Pre Plus is all the proof you need. Today's story is HTC dropped out, too. I guess they didn't see any value it Palm's Patent Portfolio nor sufficient value in webOS. lenovo is still interested, however htc dropped out after reviewing palm's books. will lenovo really pay 1.3 billion dollars for smoke & mirrors? There is NO evidence that Lenovo is nor ever was interested.